Diplomats, politicians, think tanks and journalists joined Anders Fogh Rasmussen and other Rasmussen Global staff to formally launch the Brussels office. “I have created Rasmussen Global as a business with a purpose. Through this consultancy, I personally aim to continue defending some of the causes that I believe in and pursued in my political career, such as the liberal, rules-based international order; and open trade and free enterprise. Both principles are facing external and internal threats. Because in today’s complex and dangerous world, both individuals, businesses and governments increasingly feel powerless to effect change and deliver their goals. That is why Rasmussen Global’s mission is to Connect, Shape and Influence. Influence the people that matter, either directly, or through shaping the public debate. With these values in mind, Rasmussen Global has grown significantly in the past year, and we have plans to continue our growth in our political consultancy, and in advising businesses seeking to expand into new markets. 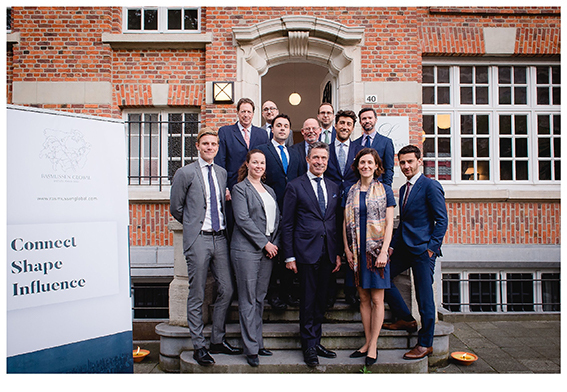 The opening of our Brussels office marks a milestone in our expansion. Our head office remains in Denmark. We are not launching a presence in Brussels to ‘lobby’ the EU institutions. We are here because we believe that, to have a real global reach, it is impossible to ignore Brussels as our European foothold. I have long believed that a small, but disciplined and agile team, can make a major difference. And I am proud to have assembled a team with a broad understanding of our complex world, and how to shape it. Our largest project is on Ukraine. I work as a foreign policy adviser to the President of Ukraine, and Rasmussen Global has initiated a campaign with two clear aims: To keep Ukraine in the international spotlight and keep pressure on Russia to comply with the Minsk agreements; And to ensure the process of reforms within Ukraine continues, despite the conflict to the east. We have achieved some major successes, especially in the USA where we successfully fought a rear-guard campaign to prevent the new US President from lifting sanctions on Russia. Now we are looking to use our expertise to help other governments, and businesses navigate their way. We are now beginning to expand into the Brexit sphere, by offering strategic advice on how to influence the process, and prepare for the outcomes. I believe we need to hear from all governments and business that have an interest in achieving a sensible and pragmatic outcome that keeps trade flowing, markets open, and a strong partnership across the Channel. We are also looking to connect businesses with each other, to break down some of the barriers of geography.